An tig thu dhan phartaidh? Howdy, there will be some games here soon. Be sure to come back! Coinneach Odhar, or the Brahan Seer as he is sometimes called, was born in Scotland in the 15th century. He was said to have had an dà shealladh, or second sight. Coinneach’s unique abilities as a seer made him famous in Scotland, and stories surrounding the man and his prophecies still live on to this day. As you learned in the Cultar section of Modal 1 Aonad 1, people with second sight often have involuntary visions and see a sign of an event of some kind. They may not understand exactly what these visions mean until after the event. Coinneach Odhar was different because he was able to control his power and make detailed predictions for people about specific things they wanted to know about. Someone with this kind of ability was called a fiosaiche. Contrary to popular belief, being a fiosaiche was not considered to be witchcraft. 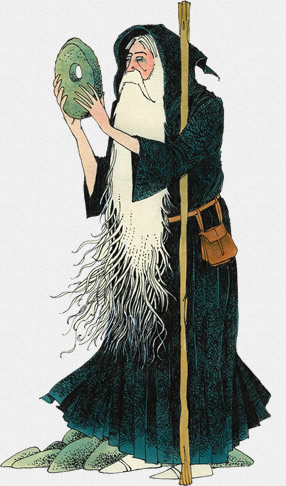 In fact, many of the clan chiefs had their own fiosaiche, who would advise them on various matters. According to legend, Coinneach’s mother was in a graveyard one night when she saw the ghost of a Danish princess. In order to allow the ghost to pass back into her grave, Coinneach’s mother demanded that the ghost should pay a tribute, and asked that her son should be given the gift to see into the future. The next day, Coinneach found a small stone with a hole in the middle of it. When he looked through the hole he could see into the future. During the course of his life, Coinneach made many famous predictions, some so accurate that they are quoted to this day. Some of the things Coinneach is believed to have predicted include the Battle of Culloden, the Highland Clearances, Scotland’s gas and oil industry and the invention of trains, planes and airships. Of course, there are many predictions Coinneach made that have not yet come true. Those who believe that his prophecies are accurate are of the opinion that it is only a matter of time before these are fulfilled. But, those who are more sceptical would say that this is evidence that his prophecies were a lot of nonsense. At the height of his fame and powers, Coinneach made his most notorious prediction, which would ultimately cost him his life. Isabella, wife of the Earl of Seaforth, said to be one of the ugliest women in Scotland, asked for his advice. She wanted news of her husband who was on a visit to Paris. Coinneach reassured her that the Earl was in good health but refused to elaborate further. This enraged Isabella, who demanded that he tell her everything or she would have him killed. Coinneach told her that her husband was with another woman, prettier than herself. He also foretold the end of the Seaforth line, with the last heir being deaf and dumb. Isabella was so incensed by this that she had Coinneach seized and thrown headfirst into a spiked barrel of boiling tar. Years later, in 1783, Francis Humberston Mackenzie, deaf and dumb from Scarlet Fever as a child, inherited the Seaforth title. He had four children who died prematurely and the family line did indeed come to an end. Standing by the lighthouse at Chanonry Point, near Fortrose, there is a stone slab that is said to mark the spot where Coinneach Odhar was killed. 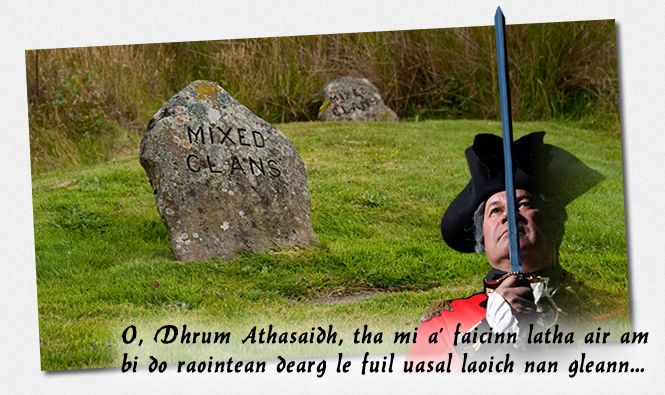 Coinneach Odhar made a prediction which foretold the fate of the Jacobite army at the Battle of Culloden in 1746. The Jacobites, led by Charles Edward Stewart, or Bonnie Prince Charlie, fought the Hanoverian army for the right to the Crown of Scotland. 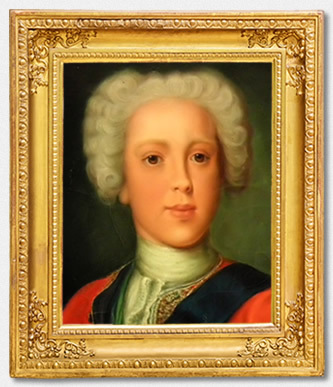 The Jacobites believed the true heir to the Scottish throne to be Bonnie Prince Charlie. History reports that the Jacobite army, arriving on the outskirts of Inverness, was starving, outnumbered and stood little chance against the might of the well organised Hanoverians. The Jacobites were slaughtered in their hundreds; their cause lost, and the Highlands were never to be the same again. The defeat at Culloden signalled the destruction of the clan system and brought about The Act of Proscription. This made it illegal for Highlanders to wear tartan, play bagpipes or carry a weapon. The Hanoverians were determined that there would be nothing different about the Highlanders in terms of language or culture. Coinneach Odhar’s prediction was worryingly close to the truth. C3 Go on! Sing a song!